About 2400 guests didn't miss out on our 10 anniversary. Further 750 online listeners tuned in to the variegated lecture and workshop programme. For the first time the Linux-Night took place and presented the preview of "The last drug" (VEB Film Leipzig, movie completely under Creative-Commons-Licence) on Saturday evening. The survey of our visitors endorsed that our dedication was worthwile. In March 2007, the Chemnitzer Linux-Tage attracted 2700 visitors with the new concept for workshops on demand, the first Asterisk day and as always with numerous interesting lectures, workshops and projects to come to the new lecture building of TU Chemnitz. In 2006, the Chemnitzer Linux-Tage 2006 attracted again about 2500 visitors to come to the new lecture building, this time under the auspices of the minister of state for economy and labour of Saxony, Thomas Jurk. Just as well as in the previous year, the weather conditions made it difficult to get to Chemnitz. Nevertheless the Chemnitzer Linux-Tage came up with a substantial range of lectures and workshops as well as 56 open source projects and companies. Furthermore the opportunity to listen to the live stream has been used actively. The weather conditions posed a challenge in 2005. Fresh-fallen snow and winterly temperatures certainly kept the one or another at home. This assumption was supported by the 600 different IP numbers from which the live streams of the lectures have been recalled. Nevertheless about 2500 participants have been visiting the "Orangerie". The current wave of flu catched our lecturers and Linux-Live contributors unprepared. Thanks to the variegated presentations it hardly catched the visitor's eye. The trend in the past years, to have a throughout wider distribution of our guests over the total federal territory, continued unabatedly. A set of workshops was already fully booked in advance. The Linux bus of Sven Guckes arrived from Berlin and brought along a clunch of friends. The mark of 2000 visitors was passed at the beginning of the event. The ambience of Chemnitz was also used by two further events: The members of the German student network for residential accommodation as well as the KDE-PIM developers held several meetings in the "Orangerie". The number of visitors increased again although other events complained about diminution. Maybe the "Indoor-Camping" was helpful: For the first time we leased some gyms for a simple but reasonably priced accommodation. The PGP-party was a novelty which will be an inherent part as a result of the high level of response. An area-wide wireless LAN for all visitors was also new which increased the number of spontaneous sessions rapidly in all corners of the house. The fourth Chemnitzer Linux-Tag as always took place at the beginning of March in 2002. We counted about 1500 guests, 51 well attended lectures with added 4800 listeners, over 50 treated computers in our Praxis Dr. Tux and 108 workshop visitors. The raisins under the lectures were Michael Bramer: "Debian, the project/the distribution", Werner Heuser: "Linux on PDAs", Klaus Knopper: "GNU/Linux without installation", Felix von Leitner: "How to write small and fast software" and Dr. Hartmut Reuter: "OpenAFS: a consolidated shared file system for Linux, Unix and Windows and Mac". Workshops were new on our programme. A limited number of participants was able to deal intensely with selected subjects in 2 to 3 hour sessions. For the first time BoFs ("Birds of a feather flock together") were brought into being which gave our guests the opportunity to get together and exchange their thoughts with some experts on a subject. The install party became the Praxis Dr. Tux (surgery Dr. Tux) with operating theatre, surgeons and nurses who helped to restore the Linux life of the sick computer. In addition to new installations the Praxis Dr. Tux is also thought for those who have other little aches and paines with their Linux. The Robo-Sumo challenge caused a sensation. Robots have been knocked together in a challenge with LEGO kits and were subsequently tested for their velocity and intelligence. Alongside with the computer free children's play area, where the smallest were looked after, one received feast for their stomach (meals) and eye (art). And last but not least: All plush penguins have found a new home. 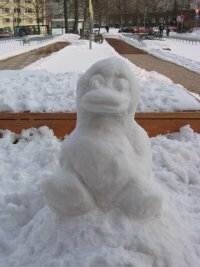 In 2001, about 1200 guests visited the third Linux-Tag and its 40 lectures, 8 presentation stands and the install party. Highlights among the lectures were well-known Linux presenters like Sven Guckes with "Computer without mouse - working with the terminal" and Kurt Pfeifle with "CUPS - the Common UNIX Printing System". In contrast to the past years, the concept of presentations has been reworked. The presentations became demonstrations with one topic which invited for discussions and enquiries. "Veni Vidi Vici" was our slogan for the second Linux-Tag. In 2000, we had two days of action instead of one. The amount of lectures has been increased from 24 to nearly 40 and the lecture programme has been expanded to current or special subjects. Exemplary were lectures of Lutz Donnerhacke: "The eternal log file and bank free money" and Reiner Klaproth: "The c't communication server". Not forgetting: the lectures and well-tried install party which met with the visitor's approval. 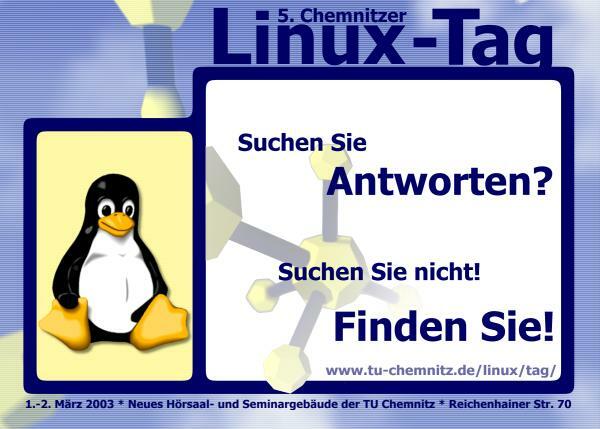 In March 1999, the Chemnitzer Linux-Tag started as an event on one day with a lecture programme, lectures and an install party. At that time we had about 700 visitors and 60 computers for the install party - for this reason it was one of the biggest Linux events in the German-speaking area straightaway.